This is the game which started the whole video game revolution as we know classic arcade gaming today. After the early 1970's when the launch of Pong was recognised as the first ever real mass-market videogame, and the subsequent followup games such as breakout were released, only a few games were released each year by a handful of companies, which were mainly shooting games with fairly predictable gameplay. There were not really that many games of note until the latter part of the decade. Launched in 1978 by Midway, Space Invaders was the first really mass-produced video game. In fact the story goes that in Japan, the game was actually responsible for a national shortage of 100 Yen coins, as they were all to be found in the game. 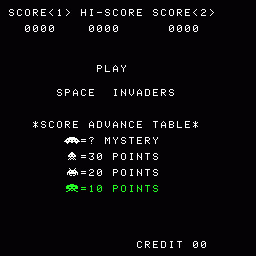 By today's standards the premise of Space Invaders is extremely simple - shoot the invading aliens before they reach the bottom of the screen and thereby "invade" your world. You control a gun which can move left, right and fire and you can only fire one bullet at a time. The invading force is fixed in a formation of 11 columns by 5 rows, a total of 55 invaders per screen, and they move across the screen until they reach the edge. When they reach the edge of the screen, all aliens move down one row, and they move back across the screen in the opposite direction. You do have an element of protection from the aliens above, by way of four bases positioned between you and the rows of invading aliens. These are gradually destroyed as they are struck by either your bullets from below or enemy fire from above, and it is possible to fire at aliens through gaps in your bases. As the aliens are destroyed the ones which remain speed up. This makes killing them more tricky, and it takes a well-placed shot to kill the last alien, which is the fastest of all. Periodically, a bonus ship will move across the top of the screen, above the top row of invaders, and this can be shot for bonus points. You gain one extra life at 1,500 points. The game ends when you either lose all your lives, or when an invaders reaches the bottom of the screen and lands on the same row you are on. A good technique is to sit behind one of your bases, moving out to fire a single shot, and to immediately retreat back behind the base, avoiding any incoming shots. Then you simply repeat the process, trying to ensure that each shot hits an alien. 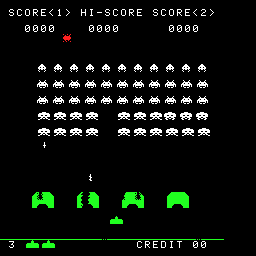 Pick off the aliens in complete columns where possible, as the less columns of invaders there are, the longer they take to move to the edge of the screen and come down a row. This gives you more time to pick off more invaders. The UFO does not appear if there are less than 8 invaders left on screen. On the lowest row, enemy shots can not destroy your base, but of course they can blow up your ship!